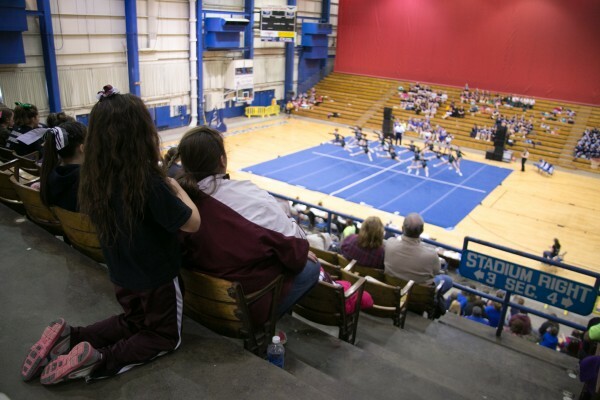 A young girl braids her mothers hair during the Eastern Maine regional cheerleading championships on Saturday, Jan. 26, 2013 at the Bangor Auditorium. BANGOR, Maine — Senior David McKusick stood in the center of the Dexter High School cheering formation Saturday morning as the Tigers prepared to perform during the Eastern Maine Class C championships at the Bangor Auditorium. His perfectly executed tumbling that kicked off their routine started the Tigers on their way to earning their second straight EM title. The Tigers turned that fun into 125 points for their routine to top the field of 12 teams. Sumner of East Sullivan was the runner-up at 118.8, followed in order by Orono, Houlton, Bucksport and defending Class C state champion Central of Corinth. The top six teams advance to the state championships Feb. 9, also at the Bangor Auditorium. Ladd has a 17-member squad, but she whittled that down to nine cheerers for this event. The other eight stepped aside after introductions and added their voices to the music and clapped in support. McKusick, whom Ladd called her best tumbler, and fellow seniors Aaliyah Williams and Harley Ponte are the floor leaders. Williams said she thought the team’s dancing was the key, while Ladd pointed to tumbling as an important facet. The Tigers had a slight wobble on an early lift, but they recovered from that and were otherwise pretty clean through the rest of the routine. Despite Dexter winning last year’s EM title, McKusick said they knew a repeat wasn’t a given. Many of last year’s cheerers had graduated. “Once we knew we could nail it, then we knew it was going to happen,” said Ponte. Sumner coach Courtney Briggs was pleased with her team’s result. “This was good after the rough week they had,” she said. Briggs saw the routine needed serious work. Big changes can be difficult to accomplish in a short period of time. Now the top six teams look ahead to the state championship. The full Dexter squad consists of: Katelyn Morgan, Taylor Goulette, Harley Ponte, Aaliyah Williams, Katie Merrill, Sarah Vigue, Mackenzie McKusick, Shayna Fogg, David McKusick, Madison Provost, Ansalewit Laughton, Danielle Whitten, Laurel Desmarais, Airiell Knowlton, Phoebe Phillips, Emmitt Ross, Alex Wulf, Stacey Allen and Autumn-Mae Young; coach: Kacie Ladd. The Sumner team is: Emma Fitzgerald, Jordan Hanscom, Cassidy Andrews, Hannah Fleming, Emily Martin, Aiyla Petty, Cynthia Stewart, Katrina Hayward, Whitney Ranco, Sarah Young, Alexandria Tracey, Amie O’Hara and Olivia Driver; coach: Courtney Briggs.